When I was younger, I QUIT gymnastics twice because I couldn't do a cartwheel. Twenty some years later, I am yet to master the cartwheel and continue to harbor a fear of going upside down - Cartwheels, diving off a diving board, handstands, flips of any kind.... My fear IS silly - it IS not rational - it IS a MAJOR obstacle on my road to the 2010 CrossFit Games. The dreaded HSPU (handstand push-up) has been something I've avoided for months. Frustrated by my earlier attempts I swore them off! I protected my ego but didn't do much to reach my goal. Last Monday I asked Megan to hold me accountable for attempting the HSPU as part of my warm up. Monday - Tuesday - Wednesday - I struggled to kick myself on the wall - let's not even talk about actually attempting the push-up part - I was glad to just turn myself upside down. I saw Friday's WOD included HSPU and figured there was no time like the present to conquer my fear! 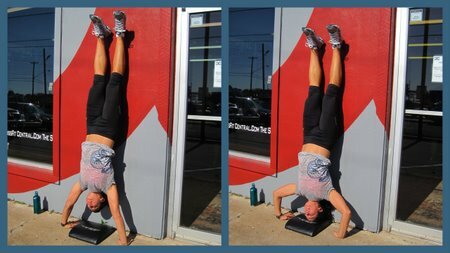 I completed 13 rounds in 20 min - 2 HSPU unassisted and successfully finished the workout without giving a second thought to flipping upside down on the wall! My fear WAS silly. It WAS not rational. It WAS a major obstacle on the road to the 2010 CrossFit Games. I have the strength - I have the determination - and now I have faced my fear. It's amazing what you can do if you put your mind to it! What are you going to conquer in the upcoming year?